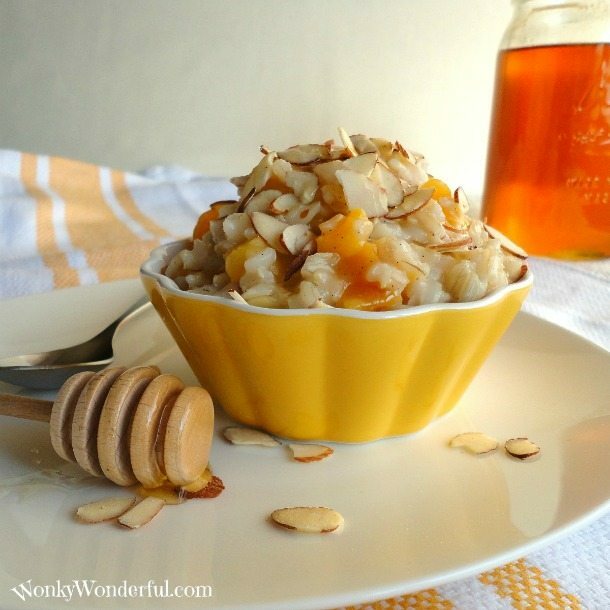 What is better than a cozy bowl of warm, creamy rice pudding on a chilly winter morning? A bowl full of warm, creamy and healthy rice pudding, of course. This healthier version is made with brown rice and doesn’t contain dairy or refined sugar. So, here is a fun fact about me: I am absolutely, positively, one hundred percent NOT a morning person! My family members have accepted this and do not attempt any interaction for the first hour after I wake. But, I have a little one that expects breakfast in the morning . . . I know, so demanding. 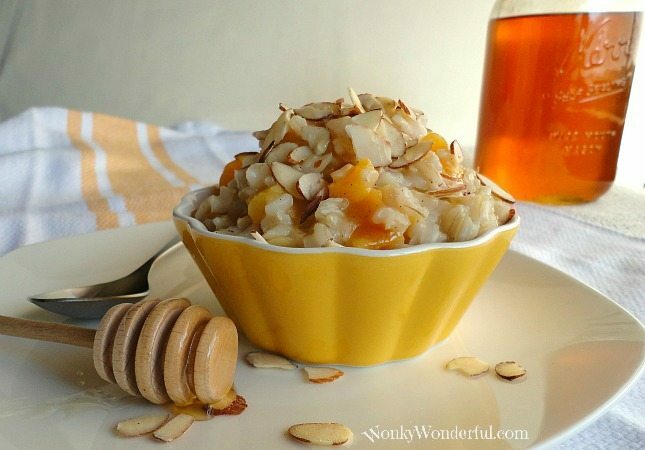 Since I am obviously not hippity-hopping out of bed and into the kitchen with a smile and a spatula, I need some alternatives.That is where this Brown Rice Pudding comes in, it is a wonderful make ahead breakfast. Prepare the rice the night before and the next morning you’ll only have to mix a few ingredients in a pot, cook for a bit and Badow! . . . Mamma made breakfast! 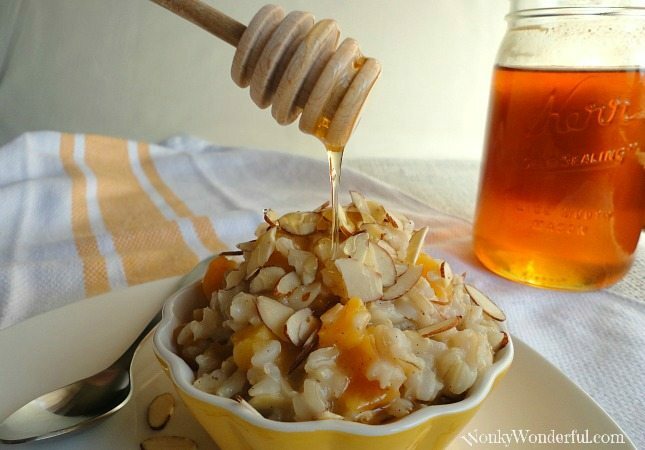 Combine brown rice, light coconut milk, vanilla and honey in an uncovered saucepan on medium low heat. Gently stir every five minutes or so and allow to cook until pudding is heated through and begins to thicken. Once pudding has almost reached your desired consistency, add the apricots and almonds. Cook for another two or three minutes then remove from heat. I like my rice pudding extra thick, so I cooked mine for about thirty minutes total. Dish up a serving of this comforting and nutritious rice pudding as breakfast, dessert or a snack. 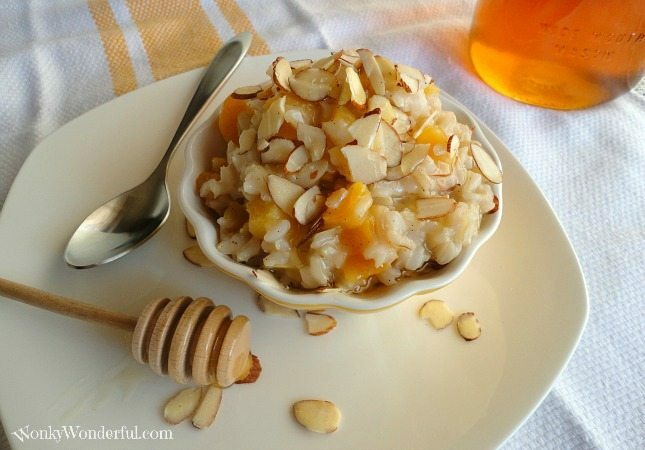 Sprinkle some sliced almonds on top for a crunch and drizzle as much luscious honey as you feel necessary. Feel free to make your own variation using a different dried fruit or nut. You could even substitute the honey for maple syrup or your sweetener of choice. 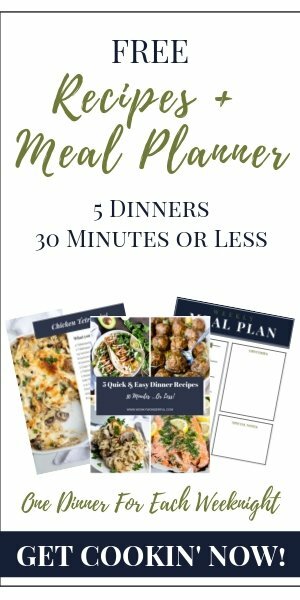 Now I can give my kiddo something warm, healthy and satisfying to put in her belly first thing in the morning. Score one for Mom! I may even have a bowl for myself, or two, or three . . . Bonus for Mom!May your days be filled with beauty, joy and rice pudding. Enjoy!